Of course you can have plenty of fun on the beach (or in the sandbox) without a lot of fancy gear. 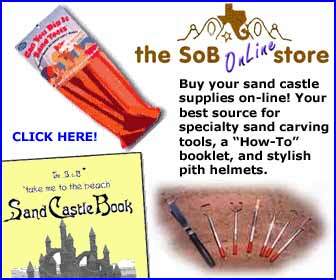 But when you are ready to get serious about sand sculpture - the fact that you found this page suggests you might already be there - you will find a growing variety of specialty items that will allow your sand sculpture - and your creativity - to soar to new heights. You will definitely need a shovel and you might do your back a favor and consider your options carefully. That fold-up army surplus number might look inviting, but short handled shovels are no fun if you plan on moving a lot of sand. We like long-handled shovels with small scoops. Our local Walmart carries a line called "Real Tools for Kids" that are just about perfect for a day's excursion to the beach. 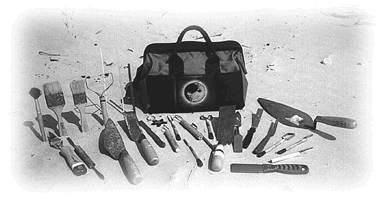 Above are the contents of sandy feet's tool bag. Learn something useful here? Interested in encouraging me to add more tips and tricks? Click here for some practically painless ways to support this site.